He's the son of a Nigerian oil billionaire and she's an Iranian model. While we definitely agree that the marriage is more important than the wedding, we're totally here for those who want to celebrate their Big Day with opulence. If you can afford it, then why the hell not, right? And that's exactly what entrepreneur Folarin Alakija and model Nazanin Jafarian Ghaissarifar did! 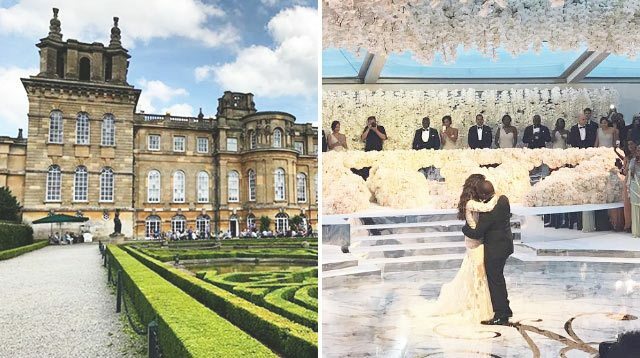 Folarin, who is the son of a Nigerian oil billionaire, and Nazanin tied the knot at the Blenheim Palace in Oxfordshire, which is the main residence of the Duke of Marlborough. Celebrity florist Jeff Leatham decorated the place with a million white roses. He's worked with Oprah and the Kardashians and is one of the Four Seasons Hotels' go-to florists. There was also a 12-foot cake so there was truly no expense spared. Guests were served a five-course menu, which included foie gras. Esqueeze me? Of course, if you're going to have a luxurious wedding, you gotta switch into a sheer number when it's time to party—how gorgeous does Nazanin look? !